We are looking for like-minded, fashion foward websites to join our exciting affiliate program! 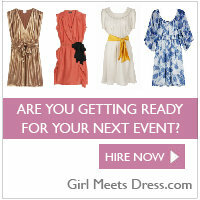 Signing up is simple and free, and as a member of our program, you will earn 4-10% commission when your visitors buy from girlmeetsdress.com (eligible for commission on sales originating from your site within 30 days). Girl Meets Dress is an online destination where women can borrow the hottest designer dresses - answering women's prayers by giving them a new way to shop...a different dress for every occasion! 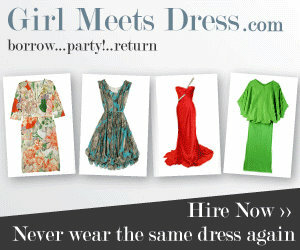 Inspired by the constant lending and borrowing which goes on behind closed doors within the fashion industry - Girl Meets Dress was launched to offer all women the option to wear any dress they wish, and is now the online destination for FASHION RENTAL by designer brands from around the world. We all have those expensive formal dress pieces at the back of the wardrobe, begrudningly bought but then not worn more than a couple of times. 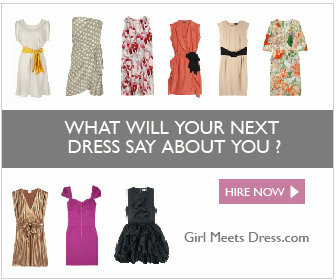 Girl Meets Dress, reconciles such fashion conundrums perfectly. We all know the biggest fashion stars borrow items for events and then give them back. Now this same service is available to everyone. All women now have the luxury to borrow something REALLY special again, again and again....for less. Customers can hire a designer dress through us without having to worry about registration or monthly fees - neither are necessary, but customers can benefit from some great membership treats like £10 off their first order, buying the dress they just hired, and priority access to all dresses. Customers can pre-order their dress/bag well ahead of their big night if they wish. Process is just like any other website. Customers browse and order the items they would like to hire. Once ordered, the order is instantly confirm and we inform them if their items will be available to try on before their chosen event date. Customers are then sent their dresses try on and we return their chosen one back for their event and refund those that were not suitable. No additional shipping fees are required and we take care of the dry cleaning..
With a collection of over 150 designer brands and 4,000 dresses (Marc Jacobs, Herve Leger, Temperley London...) customers will undoubtedly find something to wear for every occasion. Ideal for every special occasion from a simple date night to finding something ot wear to a wedding. Categories include: Cocktail Party, The Races, Black Tie, Graduation, Wedding Guest, Evening & Dinner, Work Function, Meetings Meetings, Date Night, Girls Night Out, Party Dresses, Birthday (Mine! ), Day Dresses, Rehearsal Dinner, Bridal Dresses, Bridesmaid Dresses, Mother of the Bride. Prices for a dress hire start at just under £24 for a couple of nights, and customers will adore our extensive range of ball gown dresses, cocktail dresses, and prom dresses.